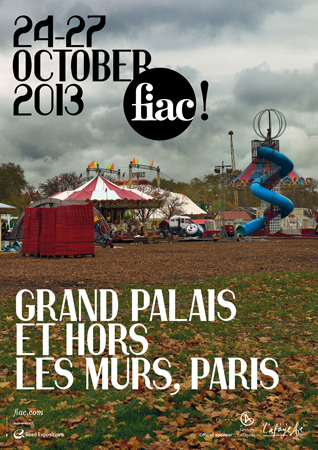 On the occasion of its 40th anniversary edition, FIAC confirms its status as a leading international art fair. Attentive to the shifting preoccupations of contemporary creation, FIAC is reactive while ensuring a spirit of continuity. 184 galleries representing 25 countries will exhibit at FIAC 2013. FIAC and the Groupe Galeries Lafayette are proud to announce the fifth consecutive edition of the Lafayette Sector, an on-going programme which provides financial support to 10 French and international galleries presenting emerging artists. FIAC 2013 reinforces its Hors les Murs programme in prestigious Parisian venues with outdoor exhibitions of sculptures, installations, performance programmes, lecture series and screenings of artists’ films. A defining aspect of FIAC’s identity, the Hors les Murs programme attracts more than 500,000 visitors each year. For its 40th anniversary, FIAC 2013 is proud to inaugurate a new Hors les Murs site, the Left Bank of the Seine. This programme has been made possible by the redevelopment of the left bank of the Seine, a flagship project for the City of Paris in 2013. An open-air itinerary along the Seine will be proposed between the Tuileries Garden, the Solférino footbridge and the Pont Alexandre III. For the eighth consecutive year, FIAC will present an ensemble of outdoor works in the Tuileries Garden in association with the Domaine National du Louvre. The exceptional context of the garden together with the continued success of the programme enables FIAC to present some twenty projects each year including installations, sculptures, performances and sound pieces in harmony with the variety of decors provided by the garden: groves, alleys, lawns, ponds and fountains. FIAC presents a programme of contemporary art works in the Jardin des Plantes, National Museum of Natural History. The works utilise both outdoor and indoor spaces: the Jardin des Plantes, but also the hallmark sites of the Museum, such as the Ménagerie, the Great Greenhouses, the Gallery of Palaeontology and the Great Gallery of Evolution. Following the considerable success of the inaugural edition in 2012, FIAC renews its collaboration with the Comité Vendôme and its members. Home to many of the most celebrated jewellers in the world, the Place Vendôme resonates with a spirit of excellence born of the encounter between age-old artisanal savoir-faire and creativity. This year FIAC and the Comité Vendôme will present an installation by Tadashi Kawamata in collaboration with kamel mennour, Paris. At the entrance of the Petit Palais immediately opposite the Grand Palais, Welcome Parade, a monumental, historic work by Jean Dubuffet, is presented in collaboration with Waddington Custot, (London), Pace (New York, London, Beijing) and the Fondation Dubuffet. For the sixth consecutive year, FIAC pursues its programme of performances, Ouvertures/ Openings, conceived and presented in collaboration with the Auditorium du Louvre. This cycle explores the borders between artistic disciplines by confronting the history of performance since the 1960s with its current forms.The 2013 edition brings together four exceptional artists and performers, showcasing an extensive array of music and sound. On the occasion of its 40th anniversary and in association with curator Mehdi Brit, FIAC inaugurates the first session of In Process, a performance cycle dedicated to the emerging art scene. Actions and hybrid creations are presented to the public over a six-day period in the Grand Palais and its outdoor sites. This programme explores the idea of re-enactment and the relationship to memory. For the fourth consecutive year, FIAC joins forces with the Fondation d’entreprise Ricard to present Cinéphémère in the Tuileries Garden. The Cinéphémère is a 14-seat cinema that is entirely equipped and installed in a custom-built shipping container. About a dozen artists’ films will be screened daily from Tuesday, October 22 to Sunday 27. In collaboration with MK2, FIAC develops its cultural programme by offering a selection of feature-length art films from the archives of MK2. Conferences and book signings will also take place, together with performances by Jeremiah Day and Marcelline Delbecq within the framework of the In Process programme. FIAC presents a series of three debates based on the theme “Political art: when culture becomes activist” at the National Museum of Natural History in association with COAL (Coalition pour l’Art et le Développement Durable). Each debate brings together an artist, a scientist from the Museum and a philosopher, related to the theme of the interactions between art, science, and political commitment. The artists presented will be Camille Henrot, Michelangelo Pistoletto and Julia Rometti & Victor Costales. FIAC presents a cycle of three conferences under the direction of Patricia Falguières, Elisabeth Lebovici and Nataša Petrešin-Bachelez. Conceived and organised by something you should know: Artists and producers for FIAC at the Institut du Monde Anglophone. The 40th edition of FIAC also provides the opportunity to discover exceptional exhibitions and artistic events in Paris and in France. The synergies that FIAC develops with the protagonists of cultural life through the Parcours Privé and the Gallery Night, Thursday, October 24, highlight the vitality of the French art scene. FIAC is owned and organized by Reed Expositions France.